Crime-procedurals in space, illegal races, drug smuggling and terrorism, The Fuse Vol. 2 has something for everyone. Ristovych and Dietrich are on the case again, this time investigating the murder of the #1 racer of an illegal grid-locking league. But Starlight’s murder soon reveals connections to drugs, weapons smuggling, terrorism, and fights over television rights. The two detectives have to contend with the I-SEEC side of the wall, the DA, vice and homeland security if they want to solve this case. And what’s the real reason Ralph volunteered for this assignment to The Fuse? 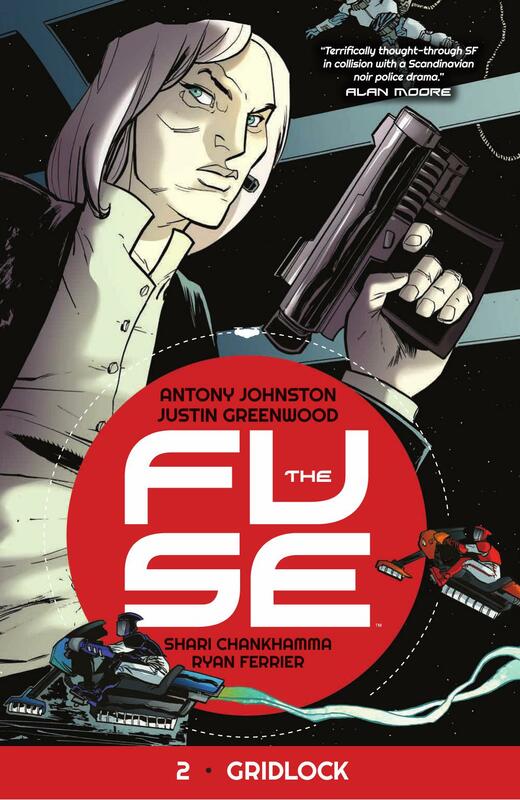 Johnson’s second outing on The Fuse continues to be full of intrigue, humor and suspense. We get a better picture of the different social strata of The Fuse, not just the wealthy on level 50, but also the station’s slums, and the wall separating Midway city from the engineers and workers who don’t want all these civilians around. We also get some clues as to Ralph’s real motives for volunteering for this post (the last page is a real shocker). We get some softening of Ristovych both in the way she interviews certain witnesses, and a grudging respect for Dietrich, consenting occasionally to calling him by this real name. I’m still loving this character, her determination, dry humor, and take no prisoners attitude. The case itself is a lot more complicated than the first arc, but Johnson does a good job of tying all the loose ends together in an understandable frame. I read a lot of these issues as they came out, and my only complaint is that it can be a little hard to keep things straight month to month, but that makes reading these trades all the sweeter. Overall I’m really liking this 6-month case structure, with ongoing mysteries throughout. This collection does not include the backup story “Tabloid” though frankly that story didn’t live up to Johnson’s standard for the series. Getting a story in 1-page chunks over six-months never seemed like a great structure, and read together there’s only so much story that can be told in that few pages. Though the world of The Fuse is intriguing, it’s the relationship between the two detectives that keeps me coming back. The cover montage for the six-issues is pretty cool, and would make a decent poster for fans of the series. I can’t wait for the new arc in August. In the meantime I’ll have to content myself with reading these two trades again.